Light Machine Gun Operator. Echo 1 USA M240 Bravo Gameplay and Tactics. 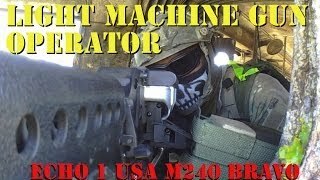 M240 Bravo game play with tactics on how to best effectively use a 240 Bravo on the airsoft battlefield. Intro Music – Movement Proposition by Kevin MacLeod. Available under the Creative Commons Attribution 3.0 Unported license.